Need Better Spokane/Coeur d'Alene IT Service? If you are an avid user of Office 365 or have in some way expressed interest in Microsoft’s online environment, then you’re probably familiar with Yammer – the freemium enterprise social networking service that is used for private communication within organizations. Also, chances are that you have come across terms such as “Yammer Town Hall,” “Yammer Power Hour,” or “Yammer Time.” They all refer to the same thing: Yam Jam. This is simply a digital meetup on the Yammer network. It provides a unique space for real-time Yammer discussions where people can exchange ideas and learn from one another. One of its strong points is that an organization’s employees have the opportunity to break the typical organizational chain of command and interact directly with senior leaders alongside fellow staff. As such, you can look at Yam Jam as a curated virtual town hall event that is held within a designated group in the Yammer network. Attendees within Yam Jam get the rare opportunity to interact directly with subject matter experts, company leaders, or executives as well as with one another (fellow employees). Anyone can participate in Yam Jam because it is actually an open environment on the network. They can ask questions related to the topic of discussion, learn from the experts, and share ideas with one another. Every Yam Jam event typically lasts about an hour but they continue on after the live event is finished, which is the best part. This makes global engagement much easier and more inclusive, which can be extremely helpful for organizations with remote staff. It brings them together regardless of where they are on the planet. Yam Jam events are also scalable and measurable, in addition to being low cost and focused. Yam Jam is not restricted to a single shape and size. The type of event you hold on this network is determined by your specific need. There is also the option to @mention someone on the Yam Jam environment so that they get notified about an ongoing event that they can benefit from. There’s so much your organization stands to gain from hosting Yam Jam. For starters, the events enable your employees to engage with multiple participants on Yammer, which can promote the culture of cooperation. Participants on Yam Jam share ideas and insights with one another and receive valuable information that they can use to better their performance and productivity of the organization overall. More importantly, Yam Jam is a means for the employees to break hierarchy and interact directly with company leadership. Participants can not only gain richer insights from subject matter experts but also get a chance to address pressing matters with the company leadership and reach solutions that may benefit them and the organization as well. Employees can build a great deal of confidence in their senior leadership from interacting in the Yammer Town Hall. Leaders also get a good opportunity to interact directly with practitioners in a way that helps them remain connected to the massive pool of talent within the organization. One interesting thing about Yam Jam is that they are rather easy to organize or set up; anyone can do it. To host a successful Yam Jam, here are some tips to ensure you have your best foot forward. Yam Jam participants need to have sufficient Yammer knowledge to effectively participate in any event on the platform. As such, it will help to do some due diligence beforehand to be certain that your team or the audience you’re targeting is well-versed on the network. Otherwise, consider offering a Yammer training session before taking the plunge. Participants are bound to contribute properly if the time is right and the discussion involves pertinent topics or ones with varying viewpoints. The time is right when the participants are in a position to take part. As such, it is best to consider time zones and days of the week when jobs and other similar engagements are not likely to stand in the way. People easily forget schedules, so it is important that you keep them properly informed about the event and the exact time, date, and topic of discussion so everyone can prepare appropriately. Remember, the more engaged the participants are, the more interaction the event is likely to achieve. The more interactive the event, the more likely it is to be productive. Yam Jam can be hugely beneficial to any organization that seeks to improve and become more productive, especially if they provide participants with a proper feedback loop, or means to give feedback at the end of the live event. If you haven’t tried it yet, then no time is better than the present. HiTechnique specializes in helping business in Spokane, Eastern Washington and Idaho. 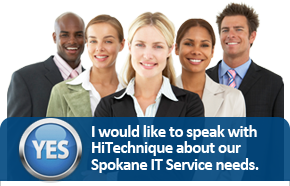 Contact Us for the best Spokane IT Services.